Whether you’re an undercover officer or in special operations, you need to communicate securely while blending into the surroundings. 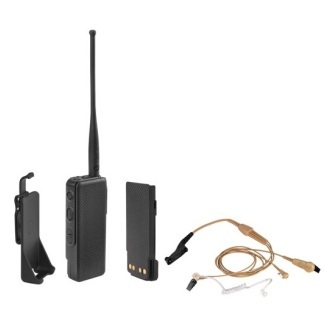 The APX3000 P25 TDMA capable radio helps you stay in contact while it stays out of sight. We designed it for covert operations by removing traditional elements – the keypad, display, speaker and microphone – to create a slim, compact radio that operates via accessories. Mission Critical Wireless accessories let you choose how to wear the radio – on a belt, in a backpack, bag or purse, on your body, or carried by a team member up to 30 feet away. Forward and backward compatible with all Motorola mission critical radio systems, the APX3000 delivers interoperable voice communications you can trust. Slim, compact radio design without traditional elements like a keypad, display, speaker or microphone, paired with a wide range of accessories for superb audio and intuitive radio controls. Available in 700/800 MHz, VHF, UHF R1 and UHF R2 frequency bands with support for analog MDC-1200 and digital APCO P25 Conventional System configurations. Secure, mission critical communication through clear or digital encrypted ASTRO25 Trunked Operation with the capability of supporting SmartZone, SmartZone Omnilink and SmartNet systems. Enables accountability and location tracking of the radio user, team or vehicle and sharing of this data via a map-based location application. Pre-recorded and user programmable voice file provides a description of the selected channel or zone. Tested and certified to meet Applicable MIL-STD-810C, D, E, F and G.
Powerful and easy to use radio programming and management platform for the Windows XP, Vista and Windows 7 operating systems, which supports USB communications and comes with built in FLASHport™ support. ¹ Per the FCC Narrowbanding rules, new products (APX 3000, UHFR1) submitted for FCC certification after January 1, 2011 are restricted from being granted certification at 25KHz for United States - State, Local Markets only. ² Radios meet industry standards (IPx7) for immersion. ³ Chargers and batteries for the APX 3000 radios do not interoperate with other APX radios. Weight (without standard battery): 6.84 oz.